Dear IELab CommunityMany exciting developments have taken place in the last year on the IELab and it is high time for another newsletter to let everyone know about it. Read below about new and updated datafeeds, new tools on the IELab Portal, new publications and much more! We hope you enjoy reading this newsletter and we'd love to get your feedback through the IELab Forum on the Hub. Yours sincerely, The IELab Steering CommitteeIELab Webinar on 3rd October 2018IELab researchers from The University of Queensland will hold a webinar on IO/IELab material, water and energy analysis with the aim to inform about recent developments and connect other IELab researchers working in similar areas. IELab researchers from UNSW Sydney, The University of Sydney, Griffith University, and the Commonwealth Scientific and Industrial Research Organisation (CSIRO) will present some recent developments and research outcomes from the IELab. The webinar will be held on 3rd October 2018 from 2-4:30pm AEST. For details please contact Noyon Nazmul IslamECE ToolThe Federal Department of the Environment recently released the National Carbon Offset Standard (NCOS) for Precincts with new guidelines for carbon neutral precincts. To date, there are no tools in the market directly targeting assessments under the NCOS Precincts (though certifications can be obtained through NABERS and GBCA). Furthermore, accounting for the multitude of contributions from supply chains is usually a complicated and a time-intensive task using the bottom-up approach. Alternatively, a top-down approach can quantify Scope 3 emissions easily and rapidly by using Australia-specific input-output data, making it a more efficient technique. Based on the top-down approach, the Embodied Carbon Explorer (ECE) online tool has been developed specifically to enable a rapid evaluation of embodied (Scope 3) carbon emissions for a project at any level (e.g. precinct, building, organisation, material, etc.). It is well suited for a quick screening assessment before full, detailed assessments are undertaken. The ECE tool i) quantifies the total impacts related to project life, ii) identifies main contributors to the total impacts and iii) provides National Carbon Offset Standard-suitable functionality. Any contributor (e.g. product or service) can be tested for its Scope 3 emissions in accordance with the NCOS materiality threshold, and those playing a relevant role can be selected to be reported. A step-by-step tutorial for ECE Tool Analysis was developed and the tool will soon be rolled out for testing by industry users.Updated Analysis on the IELab PortalThe Analysis capability on the IELab Portal has been updated with IO and greenhouse gas emissions data to 2015. The updated version of the underlying base table is now available for use - it’s titled ECE 2014-2015 AUS. To use it, create a new Analysis in your respective project, search for ECE and then select it in the table. The 2015 GHG data for the 344 sectors of this table were updated by Soo Huey Teh and are also available as a CSV file on request.Household expenditure datafeed completedTwo important datafeeds for household expenditure data were recently completed by Futu Faturay from ISA at the University of Sydney. This data feed writes constraints for data from the ABS Household Expenditure Survey (HES) for 2009/10 and 2015/16 (Catalogue Number 6530.0, http://www.abs.gov.au/ausstats/abs@.nsf/mf/6530.0). It is a very important feed for any MRIO base table and analysis including states/territories and larger cities. Raw data are taken from “65300DO013_201516 Household Expenditure Survey, Australia: Summary of Results” and include Detailed expenditure items for Greater Capital City Areas (Table 13.3A) and for States (Tables 13.9A). The data feed also processes relative standard error data from the ABS files (Tables 13.3B and 13.9B). This data feed writes constraints for data from the ABS Household Expenditure Survey (HES) for 2009/10 and 2015/16 at the level of SA4 regions (Catalogue Number 6530.0). It is a very important feed for any MRIO base table and analysis including SA4 regions. Raw data for this feed were purchased from the ABS and include 2009/10 and 2015/16 Detailed expenditure items based on 87 SA4s regions, covering all of Australia (ASGS 2011). The data feed also processes relative standard errors for these data. The completion of the HES datafeeds was sponsored by UNSW Sydney.Greenhouse Gas datafeed updated (ANZSIC)UQ researchers Ka Leung Lam and Joe Lane updated the GHG datafeed on the IELab. This data feed provides constraints data from the Australian Greenhouse Emissions Information System (AGEIS) database. The ANZSIC-classified greenhouse gas emissions data are available at the state and national levels from 2000 to 2015 for carbon dioxide (CO2), methane (CH4), nitrous oxide (N2O) and carbon dioxide equivalents (CO2-eq).IELab used to develop a semi-automated hybrid LCI modelResearchers at The University of Melbourne have recently developed a model enabling semi-automation of the path exchange method of hybridisation. The model, which automates various components of the approach, is described in a recent journal paper published in the International Journal of LCA (available here or here). It includes a series of inter-related modules developed using object-oriented programming in Python. 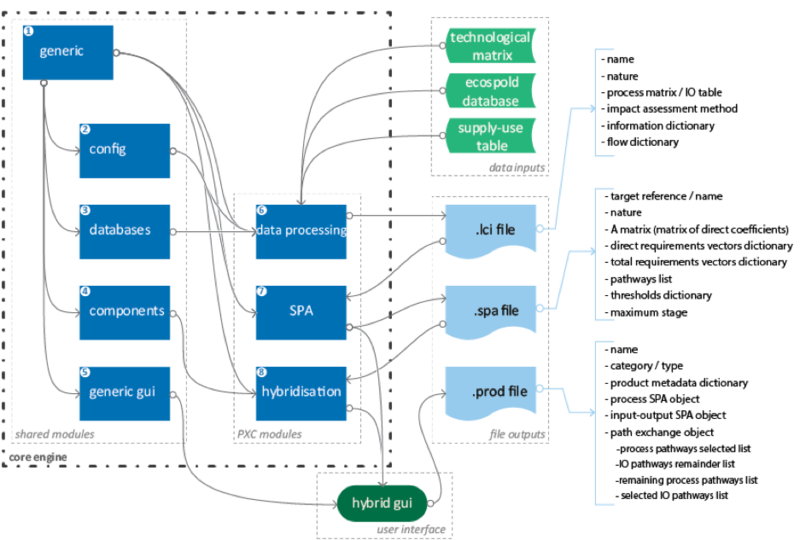 Individual modules have been developed for each task involved in compiling a hybrid LCI, including data processing, Structural Path Analysis, and path exchange or hybridisation. The model is currently being used to develop a comprehensive database of hybrid coefficients for building materials, using input-output data in the form of a supply-use table collected from the IELab, and AusLCI as its process database. Full automation of the node correspondence process, where nodes relating to identical processes across process and input-output data are identified, remains a challenge. This is due to varied dataset coverage, different levels of disaggregation between data sources, and lack of detail of activities and coverage for specific processes. However, by automating other aspects of the compilation of a hybrid LCI, the comprehensive supply chain coverage afforded by hybrid analysis can be made more accessible to the broader LCA community. A detailed video walkthrough of the model is available in open-access on Figshare. This work shows some of the broad potential of the IELab as well as its critical importance to the development of various LCI approaches beyond pure input-output analysis.IELab for teaching: Student Assignments entering 2nd yearThe IELab Portal is increasingly being used for teaching by UNSW and the Universities of Sydney and Queensland. The Analysis function on the IELab allows for a quick and complete assessment of carbon footprints (scope 3 emissions) and other indicators, based on expenditure data. Currently about 200 students are using the IELab for an assessed assignment which is worth a considerable share of their total course mark.IELab publicationsIELab researcher have now produced more than 50 publications, most of them journal papers! These publications are either about IELab developments or have used IELab data. The full list of IELab publications is appended at the end of this newsletter and is also available online at the hub's citations and publications. From there, all citations can be exported in BibTex or EndNote format!Featured publicationVery recently, this study about the economic impacts of Cyclone Debbie has been published, demonstrating the exemplary capability of the IELab to cater for sub-national IO analyses. • Elijah Tyedmers: Cook Islands sustainability study Australia-Indonesia Virtual LabIT News reports on ISA's DFAT grant to promote the Australia-Indonesia Virtual Lab developed by Futu Faturay and Manfred Lenzen at the University of Sydney, in collaboration with the Indonesian Ministry of Finance. The virtual lab will be a collaborative online environment in which Indonesian and Australian researchers and analysts can share their data, tools and insights on sustainable development issues of interest to both countries.IELab as a data platform for researchersAre you planning your next research project? Are you advising research students considering their project or PhD options? The comprehensive datasets and analytical tools from the IELab can give you a head start, providing access to data and allowing researchers to get straight into analysis, rather than spending time getting data from scratch or chasing permissions for existing datasets. One example are the official greenhouse gas emissions data from the Australian Greenhouse Emissions Information System (AGEIS) from the Federal Department of the Environment). Retrieving data from this platform is notoriously labour intensive and can be one of the most time consuming and frustrating data collection tasks environmental researchers in Australia may face. IELab software engineer and IT specialist Daniel Micevski developed an algorithm that allows for GHG data to be scraped automatically from the AGEIS website. Using this tool, it was possible to retrieve time series of Australian GHG data from 1990 to 2016 in both ANZSIC and NGGI classification. The datasets are available to registered IELab users on request through the ticket system. The data resources of the IELab are giving researchers and students access to the numbers they need to answer their research questions. Check out the possibilities that IELab offers. Register on the website, contact us if you have specific questions or submit a ticket if you encounter a problem.IELab user feesOperating and maintaining the IELab is associated with considerable costs. Even though the managing teams at UNSW Sydney and the University of Sydney manage to internalise some of these costs or compensate them with project funds, there still is a large funding gap which prevents us from operating IELab as professionally and smoothly as it should be. We therefore want to say a big Thank You to all users who have paid their user fee! For those who haven’t done so yet, please pay at any time – your access will be valid for 12 months from the date you pay the fee. Researchers should please continue to include future IELab user fees in any funding proposals they prepare!User photosThe IELab is faceless without your photo! Communication via the IELab Forum becomes much more human when members upload their photos. Please upload yours today on your IELab profile. All users, please make sure you are subscribed to the IELab Forum!Receiving the IELab NewsletterIf this newsletter was forwarded by someone else to you and you would like to receive it directly, then please register on the IELab Hub. Set the rules of your email account so that it allows emails from …@ielab.info to avoid the newsletter going into your Junk folder.APPENDIX – All IELab-related PublicationsThe full list of IELab publications is also available online at the hub's citations and publications. Fry, J., Lenzen, M., Baynes, T., West, J. and Geschke, A. (2017) Constructing a time-series of physical input-output tables for Australia. Economic Systems Research, Revision stage. *) The IELab Steering Committee currently includes Tommy Wiedmann, Manfred Lenzen, Steven Kenway, Tim Baynes, Robert Crawford, Peter Daniels, Christopher Dey and Khanh Hoang. Contact Us? If you no longer want to receive our newsletter, please unsubscribe.